Typhoon is a motion estimator primarily aimed at (turbulent) fluid flows. This algorithm extracts the apparent motion within a given image pair, and returns a 2D vector field representing this motion. It uses a dense optical flow approach, and relies on a multiscale wavelet representation of the estimated motion. The figure below shows an example of motion estimation. 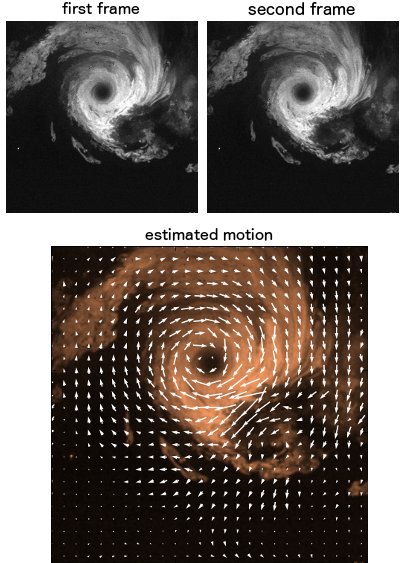 Top figures are two consecutive frames from a video sequence of a rotating vortex that is visualized with smoke. Bottom is a vector plot of the motion field estimated by Typhoon from the pair of frames. The first frame is shown in the background for reference, and the vector field has been subsampled by a factor of 10 in both dimensions. client-server mode for custom IO and pre/post process. A demo is available by simply typing demo in the Parameters field. It features synthetic particle imagery (PIV) data. User-specified files, if any, are ignored. At the end, the two input image files are available ("run010050000.tif", ""run010050010.tif"") as well as the estimated and ground-truth motions ("UV.inr", "UVtruth.inr"). The corresponding set of parameters (see below) would be run010050000.tif run010050010.tif 3 3 1 1e-2. The user should provide two image files using the Upload or URL fields, for instance "a.jpg" and "b.jpg". Most image formats are handled, more specifically all formats supported by Imagemagick. Note: without the GPU-acceleration, the estimation can take some time with large images. For rapid results, it is highly recommended that no image dimension should be greater than 512 pixels. alpha_value: the regularization factor, typically on the order of 0.001 - 0.1 for regul_code=1. An example would be "a.jpg" "b.jpg" 8 6 -1 0 for an estimation featuring 6 motion scales estimated out of 8, and no regularization. See "More on parameters" below for detailed information. The estimated motion is written as an INR file "UV.inr". It is given in pixel units, in the usual image reference: origin top-left, x positive towards the right, y positive towards the bottom. Basic functions are provided to open these .inr files in Python and Matlab. These parameters are positive integers. Let scales_decomposed=D ≥ 0. It corresponds to a "subdivision" of the input images in square blocks of size 2^D (padding the images with 0 if necessary). Then, within each blocks, D wavelet scales are considered. The more scales, the better the algorithm can handle large displacements. Now, regarding scales_estimated: it corresponds to the number of scales actually estimated with respect to the number of scales considered. Let scales_estimated=E ≥ 0, then 0 ≤ E ≤ D. E=0 means that only the very coarsest scale is estimated (faster, but coarse vector fields), while E=D means a full estimation (longer, but finer vector fields). In practice, it is often possible to get good results with E=D-1 or E=D-2. See Dérian et al. for more information on the wavelet-based optical flow. At first, the most useful are probably (-1) and (1). Note that with (-1), no regularization, scales_estimated=E ≤ D-1 in order to close the estimation problem. See Kadri et al. for more details on the regularization schemes. The alpha_value balances the respective influence of the regularization term and the image data model. The larger alpha_value, the more regularization. Typical starting values range around 0.001. Note that alpha_value is ignored when regul_code=-1. Dérian, P.; Mauzey, C. F. & Mayor, S. D.
Dérian, P.; Héas, P.; Herzet, C. & Mémin, E.
Kadri Harouna, S.; Dérian, P.; Héas, P. & Mémin, E.